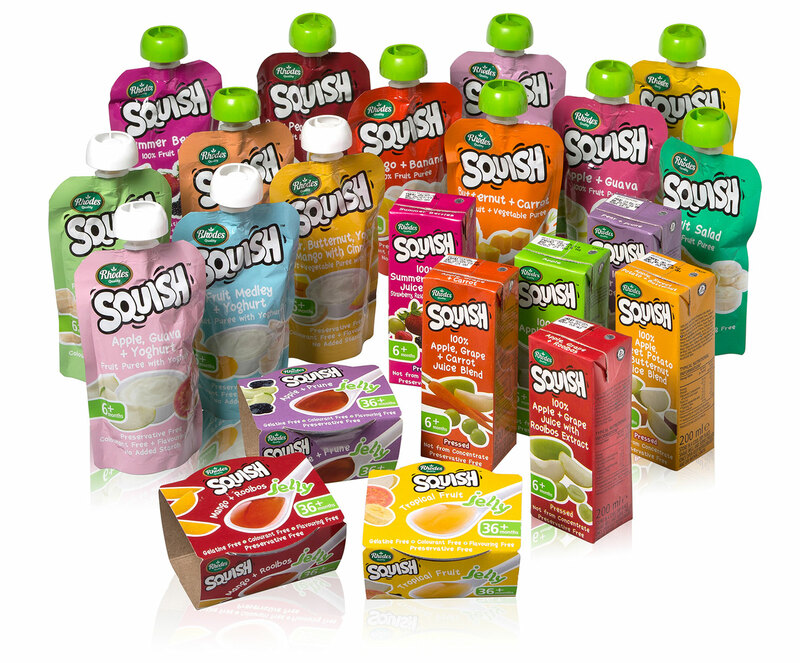 Rhodes Food Group, producer of popular convenient baby and toddler food brand Squish, has launched an extended range to its Squish portfolio of 100% fruit and veg purees, and 100% fruit and veg pressed infant juices. The exciting new additions of fruit and veg puree pouches with full cream yoghurt, as well as a range of ready-to-eat fruit jellies, will compliment and expand the current offering. Squish is the second largest baby and toddler brand in the defined market, offering parents a wide range of meal and snacking solutions for all occasions. The new range includes: four new yoghurt flavours, two new puree flavours, and four new ready-to-eat jellies. In addition, Squish has fourteen 100% fruit and veg puree combinations, and six pressed 100% fruit and vegetable infant and toddler juices to complete the range. “Our Squish yoghurts are made from 100% fruit and vegetables with double cream yoghurt, not yoghurt powder, which offers us an impressive point of difference. As with the rest of our range, our yoghurt purees are free from preservatives, colourants, flavouring and starch and come in four tasty flavours,” she says. “We understand that parents want the best for their children, but they are often pressed for time. With Squish, they can feel confident in the knowledge that they are not compromising – our clean ingredients offer them a convenient range of meal and snacking solutions at home or on-the-go, as if cooked at home in their own kitchens”. Norman says, “We understand the weaning journey and we can offer our consumers a range of options that will help them on their way, from starting solids right through childhood.” She adds that this is why it is so important that Squish continues to innovate through the product offering with a wider range of mealtime and snacking solutions that meet the needs of growing children from 6-months old right through to 3-years plus. The addition of rooibos to our new pear and peach puree, in our apple & grape juice, and in our new mango jelly shows our commitment to adding value to parents and innovating ahead of the curve.